The obelisk of local white Millstone Grit is 103ft high and 19ft square at the base. It is owned by The Buchanan Society and was erected in 1788 to the memory of the Historian and Scholar George Buchanan (1506 - 1582). 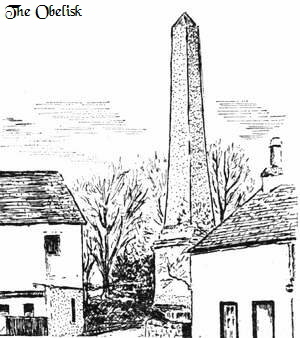 The obelisk dominates the house where George Buchanan was born in the village of Killearn. George Buchanan, having spent his younger years in Scotland, went to Paris at the age of 14 to begin his studies. He later returned to Scotland and graduated at St Andrews University in 1525. He became well known as a writer and educator not only in Scotland but also in Europe. He was a critic of corruption and inefficiency in church and state during the period of the Reformation in Scotland. George Buchanan was made classical tutor to Mary Queen of Scots in 1562 and principal of St. Andrews in 1566. In 1570 he was appointed tutor to the young king James VI of Scotland, who also became James I of the United Kingdom. He died in Edinburgh in 1582, aged 76.